Hill Country Homebody: Sphere Not! 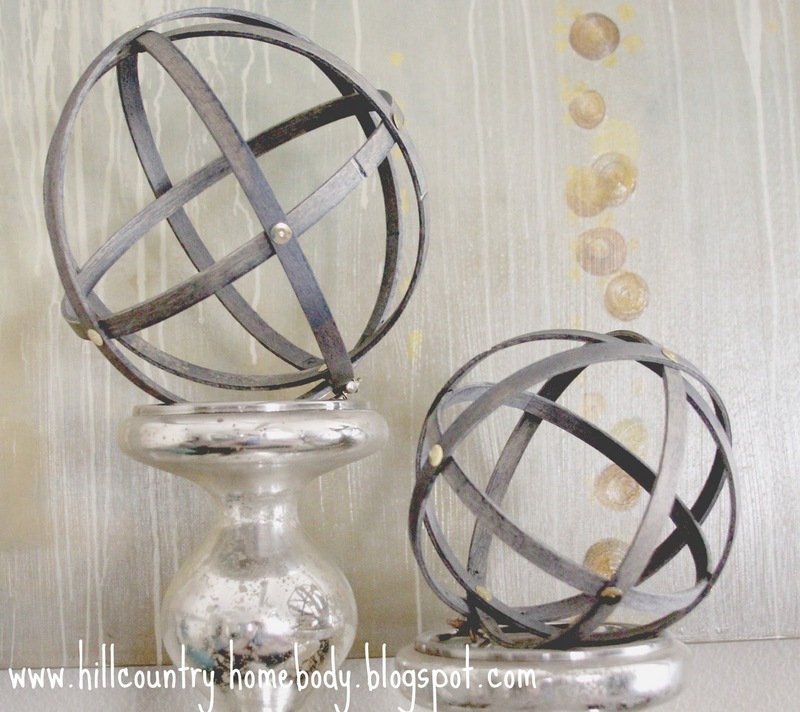 Has anyone noticed the sphere madness in home decor lately? I have and I like it! Don't you? I mean we've been filling bowls with balls for years right but these guys are more interesting and don't need a vessel. They can stand on their own. You can go look for yourself at West Elm. in true cheapskate fashion I didn't want to pay that. I would rather save my pennies and buy some other awesome stuff from there that I can't make on my own. You wanna see how I made mine? Teehee I love this stuff! I took apart each hoop and started playing with the 4 small pieces (there are two pieces per hoop if you have never played with these guys before). I placed them inside one another and moved them around until they looked like this. I wanted to make sure I could get them to look right before I messed with staining them. My original thought was that after I stained them I would just attempt to hot glue them together. I decided I would line up and interlock the two tightening thingies to hold them together fairly well and then glue them together. Since I had two weeks to think about how I wanted to keep these balls together I decided to steer clear of the hot glue idea and tack them together instead. Literally! Seriously this wood is so soft that the thumb tacks went in really easy. No they don't go all the way through two layers of hoop but they do hold it together just fine! 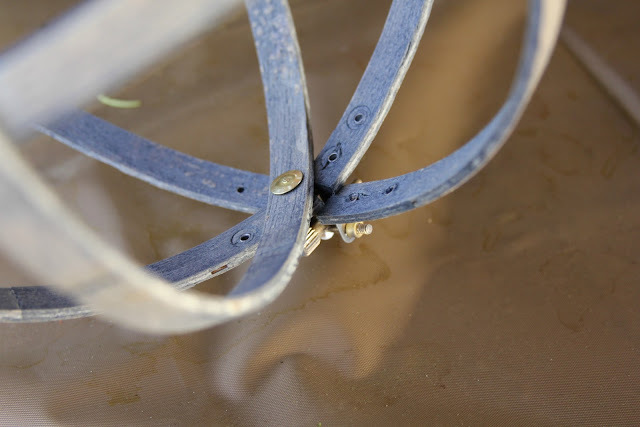 Woohoo...no messy stringy hot glue! I originally thought I would buy these and take off the tightening thingies but I don't mind how they look with them(I stained over the metal too so they don't stand out as much). I think if you have ever stuck with me enough to read any of my posts you know by now that I am a sloppy, messy, or even a half *** crafter. You will find no attempt at perfection in any project at this house. We are just typically excited to get r done! So there ya have it! Mine aren't as large as the ones linked to above but I like them just as much and for about 6 bucks (we already had the stain and brush) I actually LOVE them! That is greatness! Apparently, we both had embroidery hoops on the brain! LOL! Very clever!! This is awesome! I'm loving the sphere look but there's no way I'm paying $20-$30 each for them- thanks for the tutorial- I'll just make some too! 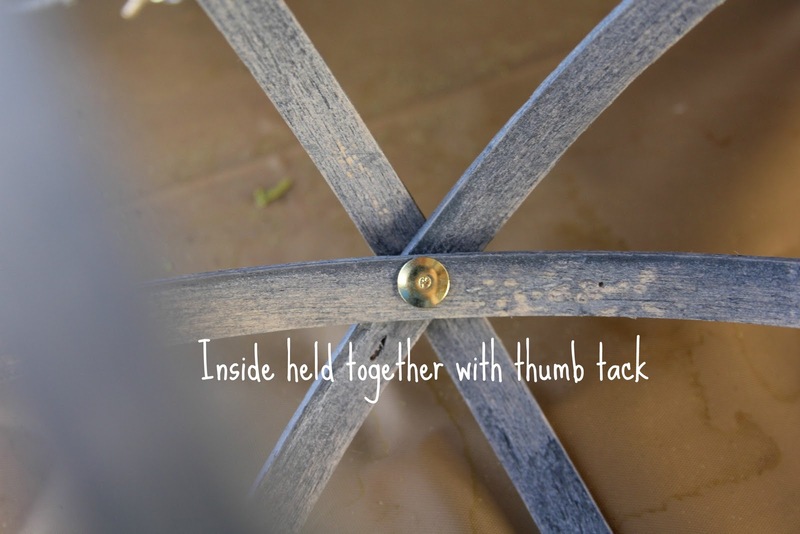 I'm hosting a linky party, the theme is all time favorite post- would love it if you joined in! oh my gosh, those are great. you'd never know they were a diy project! 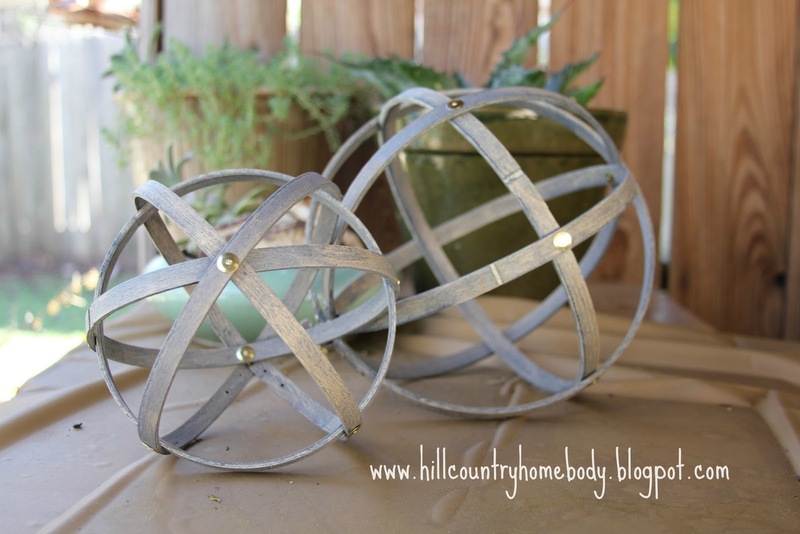 love the spheres...great idea! Love that you call yourself a half*** crafter LOL. i think i may fall into that catagory as well. I like only projects that are DONE in one day or less! Will continue to follow! I LOVE this!! This is SO my next project! Thanks for the inspiration! This is AH-Mazing! I'm so going to do this for my next project! That is a great looking craft! How clever are you? How awesome is this! I'm pinning this for sure :) Especially love the savings! Such a fantastic idea! I love these! Love these. Love the price too. Saw you on Blue Cricket Designs. I am so impressed! These are great looking. Clever Texas girl! Such a great idea! Super modern. LOVE it! 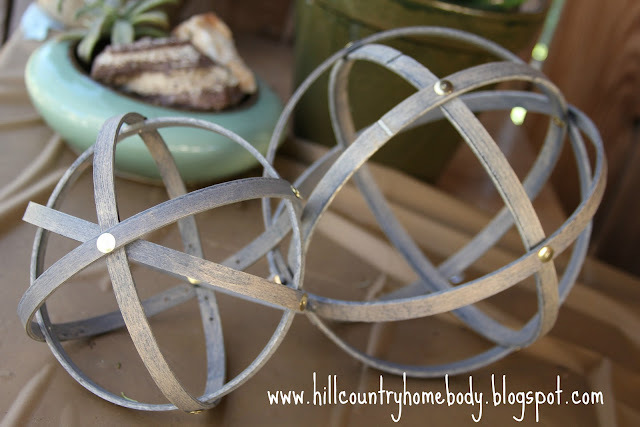 I need some bulky items for my new bookshelves and these will be perfect! Great idea-thanks for sharing! Genius. Great idea, beautifully executed. Truly inspiring. Oh! I love this! I'm your newest follower! Those are the projects I like to see.. easy, cheap and, look wonderful! Wonderfulness! 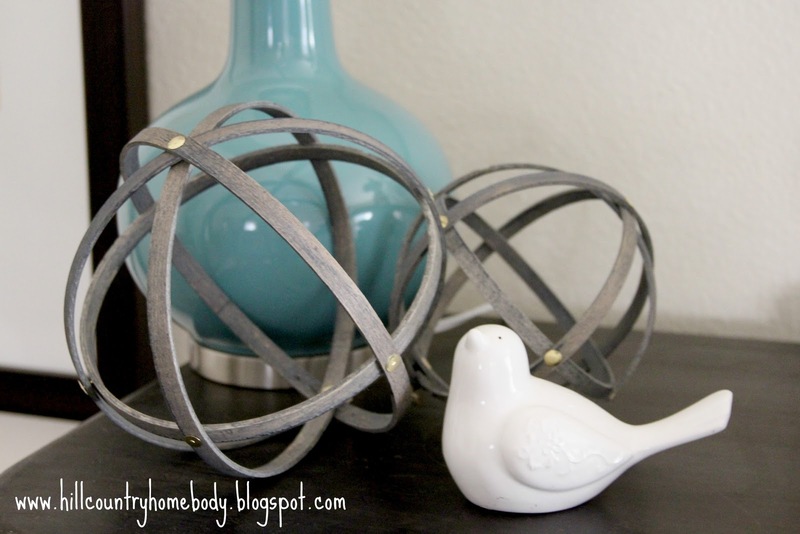 I love decor balls and your project is a perfect contrast. So cool and clever! These are so awesome! Fabulous job! Genius idea! The hardware took the stain on well. I love the way it looks...industrial. Well done! I'm stopping by from At the Picket Fence. these look GREAT! I love the color you chose too! Thanks so much ladies! I really appreciate all the sweet comments! I think we all love a good cheap project! I LOVE these! Simple, yet so 'architectural'! I'm pinning 'em! These are just awesome! They really look like metal. Love them. Pinned them. I LOVE these. So smart, so stylish! Wow, these turned out so great!! I hope to try to make some! This is stunning!! You are sooooo clever and creative!! We would LOVE for you to link up to our Uncommonly Yours link party! I'm a get r done crafter too, so this project really spoke to me. Such a clever idea to use hoops! I'd love it if you'd share this at my Show & Tell party, going on now @ the Delectable Home. Those are AWESOME!! That was really clever! I am going to pin this and definatley give it a try! Thanks for sharing! Started following you from the Blog Hop! Follow me back!! Love these! What a great idea. I love this idea and I just pinned them. Brilliant.....so easy and fabulous all at the same time (my favorite combination). I am very impressed with your creativity and ingenuity. Your feature at Fridays Unfolded is well deserved. The spheres look great! I don't know....this is perhaps just the COOLEST craft idea I've seen all year. 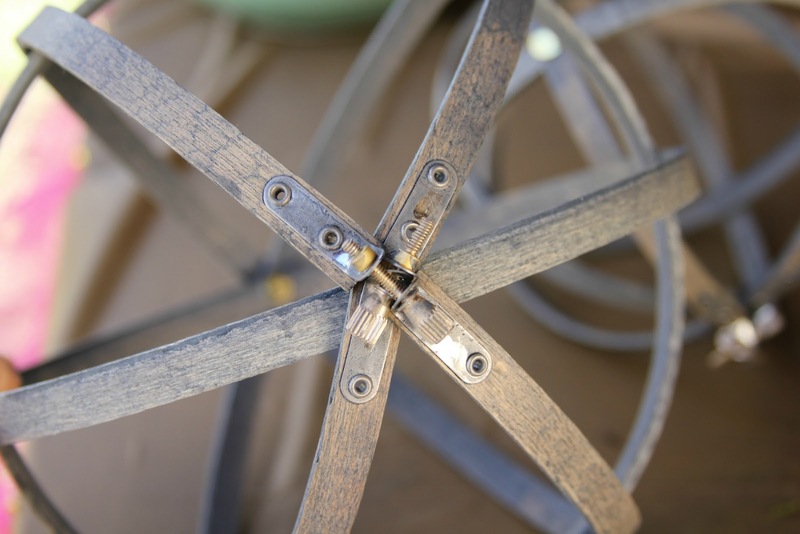 And here I thought I'd have to try to figure out how in the world to make those out of those strips of metal with the holes without looking dorky and homemade. LOL! This is WAY better...yay and thank you so much! Your spheres are wonderful and so creative!!! AWESOME IDEA - I love that you decided to find a way to make them yourself. I think I may have to give it a try. I myself am also a half*** crafter - lol. Really cool project! I thought your first picture was what you were trying to DIY. I have a bunch of embroidery hoops that I got from an estate sale, and this is a great way to use some of them. Thanks for sharing! This is brilliant! You are so clever to have come up with this! I'm a new follower & also following on Pinterest. Grand idea! Not generally a maker/lover of thinkgs to dust : ), but will do these!Especially LOVE the tacks...they give it the steampunk uuumpf that's so popular, never mind the fact they help hold it together. I will be trying this very soon! Brilliant! I have a ton of embroidery hoops - now I know what I am doing with them. This is a wonderful idea! I was just eyeing some spheres at the home store and thought to myself that I knew I could make them. lol I never even thought about embroidery hoops and I'm a stitcher!! Thank you for sharing! These are absolutely genius!!! Thanks for sharing. I am totally gonna try this out! I have been pining to make these. I am getting closer to doing it! Yours look awesome - just like the West Elm ones! Thanks for the tutorial! this is really great. I love west elm but tend to make similar designs for half the cost.